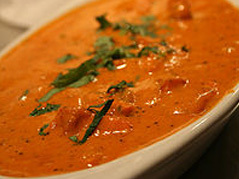 Spice Hut serves fresh, desi-style dishes prepared from the finest indian spices sourced from around the world. Vegetable Samosa / Beef Samosa 2 Pcs. Meat or Vegetable filling, folded into a triangle, deep fried and served with yougurt chutney (sauce). Thin sliced assorted vegetables rolled in gram flour, deep fried and served with yougurt chutney (sauce). Fish cubes marinated in special indian spices, deep fried. Boneless Chicken marinated in special Indian spices and yougurt, cooked in clay oven (tandoor) and served with fresh salad and chutney (sauce). Boneless Beef marinated in special Indian spices and yougurt, cooked in clay oven (tandoor) and served with fresh salad and chutney (sauce). 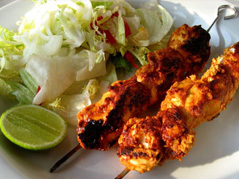 Popular Seekh Kabab 2 Pcs. Minced meat with onion, green chilli, herbs and spices, cooked in clay oven (tandoor) and served with fresh salad and sauce. Choice of Chicken, Lamb, Keema (ground Beef), Shrimps (add $1) or vegetable (subtract $2). Traditional hot curry cooked in a home made blend vindaloo sauce. Choice of Chicken, Lamb, Keema (ground Beef), Shrimps (add $1) or vegetable (subtract $2). Prepared with green peppers, onions, fresh tomatoes and coriander.